We are a family owned wildlife and Pest Control company operating in Tampa FL. We are blessed to live and work in this beautiful area. Many of our clients enjoy watching backyard wildlife from a distance and are even tolerant of insects as long as they stay outside. It is when they start moving into our homes or spending too much time in our yards that they truly become pests. That’s where we come in! Whether a raccoon moves into your attic or an ant trail forms in your kitchen we’re here to help. Tampa Wildlife Control can handle all aspects of your animal or pest problem. Our goal is to keep your family, your pets and your home or business safe from pests. With over 35 years of combined experience managing residential, commercial and municipal accounts in and around the Tampa area, you can rest assured that our team will get the job done. If you are having trouble with any nuisance wildlife or are overrun by insect pests give us a call today! In many cases a quote may be given right over the phone after we ask you a few questions about your particular problem. Wildlife Removal is not one size fits all! Regardless of species, wild animals all have individual personalities and there is no “one size fits all” control plan when you're dealing with Critter Control. Each job is unique and should be handled as such. It can be difficult, dangerous and even illegal for a homeowner to handle themselves or let an unqualified person attempt to. You really need someone who understands the animals to be able to properly solve your wildlife problem. We will assess your particular problems and implement a program to meet your wildlife control needs while taking all applicable regulations into account. We practice integrated pest management and not every job will require trapping. In some cases we can simply help you modify the habitat around your property to discourage unwanted animals from staying there. We are licensed by the Tampa Wildlife Resources Agency and the Florida Department of Agriculture. We are also Bonded and Insured so you can rest assured that Tampa Wildlife Management Pro's can handle all of your Animal Control needs. We get the job done! Tampa Wildlife Control provides Melbourne Wildlife Control services throughout the Tampa area. We also use live cage traps whenever possible to capture the targeted animals. We use several makes and models of traps to solve specific problems for our clients. Some of these traps may look a little strange and aren’t what you might find available at the local hardware store but they are all considered to be humane despite their looks. Cage traps are our “go to” in most cases but some species are not able to be captured in this type of trap and we may use a variety of other control methods to solve your wildlife problem. The baits we use to trap animals may vary from junk food to species specific pastes depending on location and what we are capturing. How we safely trap your nuisance animal in Tampa, Tampa And Tampa area. Safety is our Wildlife Experts number one concern when determining the location and style of trap to use on a job. We ask that you please be sure to let us know if you have any particular concerns about an area to be trapped. We do our best to ask the questions that guide the safe placement of traps but care should still be taken to keep children and pets away from them. We realize that the opportunity to view a trapped raccoon or groundhog up close is very tempting (no one seems to want to check out the skunks!) but even a caged animal can pose a threat. If the situation allows, we will give you the opportunity to take a few pictures and get a closer look when we pick the animal up. The one way valves shown below are often used to remove bats and Bat Poop from attic areas. These valves are placed as we seal up areas of the home that bats are using. They normally are left in place for a week or more depending on the severity of the problem. After that, all remaining entry points are sealed once we’re sure that the bats have safely made their way out. Bat Removal is regulated by the season. If you feel that you may be having an issue be sure to call us immediately! Once the animals are removed from your structure we can help keep them out! Animals leave a mess behind. 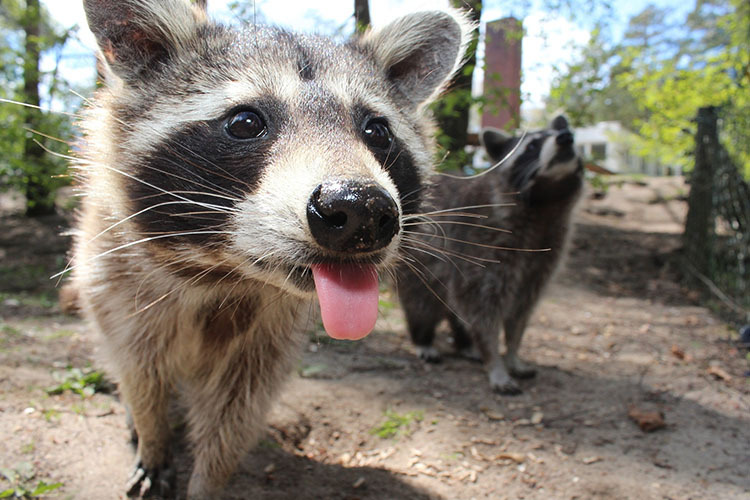 Raccoon Poop and odors from their presence can draw more wildlife to the area. Although we ensure that the animals we remove will not make it back to your property, the point of entry will be there for the next animal unless it is properly sealed. Cleaning up the mess and properly sealing entry points is essential to keep your structure pest free in the future. We use quality materials and our unique animal exclusion techniques to animal-proof your structure and seal out future problems. 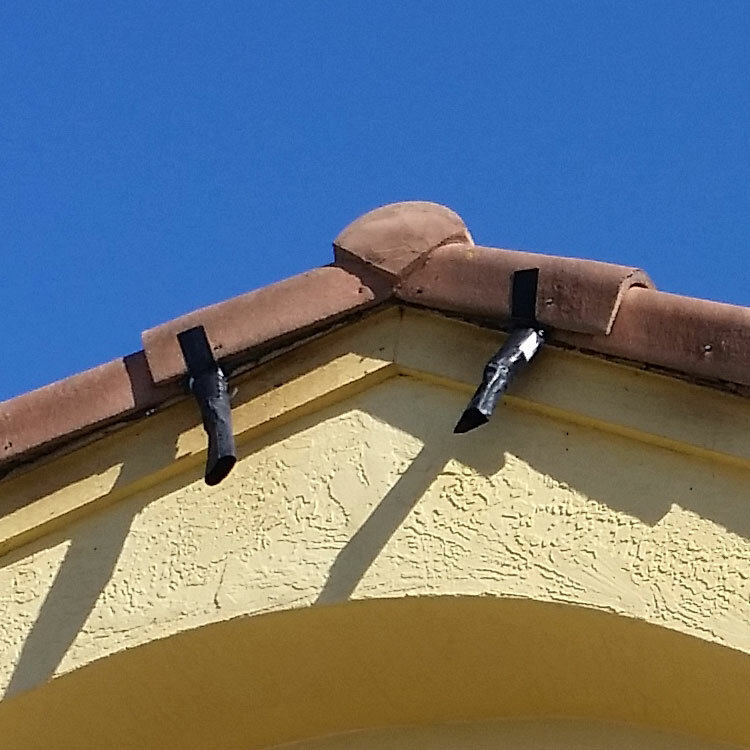 The owner of this home had dealt with birds nesting in the fascia for many years. After being unhappy with work done by someone else, they called us. The birds had already broken through previous repairs and started nesting, meaning they needed Bird Removal. We cleaned up the mess and made the repairs the way they should have been done to start with. Now you can’t tell that there was ever an issue! We pride ourselves in leaving your home looking as good or better than before we got there. 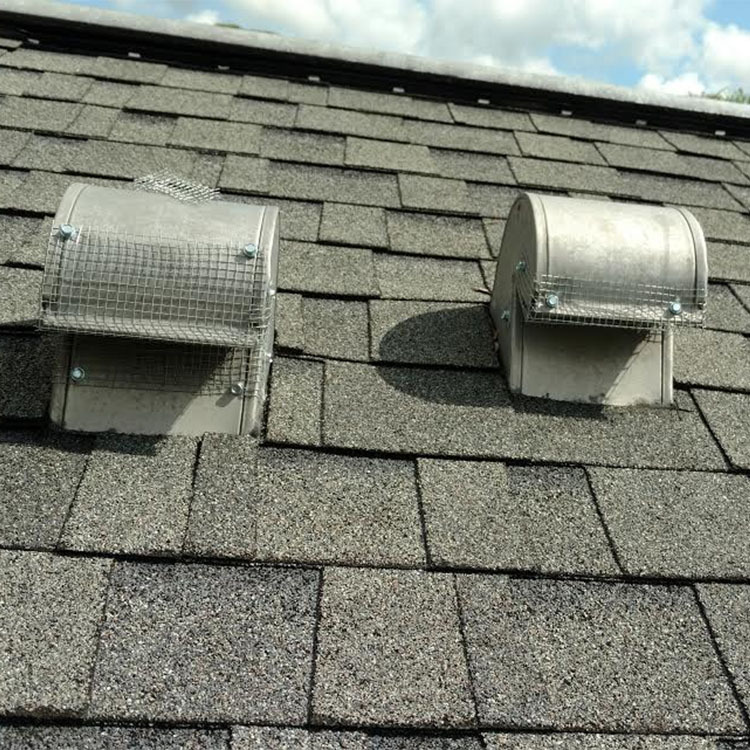 Squirrels had squeezed their way into this home’s attic through the gable vent. While being up to standard for construction, the old screening just wasn’t strong enough to keep the squirrels out. Some wildlife companies and most carpenters would simply replace the torn screening with the same material. We repaired the louvers and used a heavier wired screening. We also added trim boards to improve looks and add strength. Now it is strong enough to withstand the squirrels and raccoons too! This is a common area to be utilized by animals entering homes and we have developed our own animal proofing methods to prevent future entry. Don’t fall victim to this preventable problem, contact us for an inspection to see if your gable vents are vulnerable. If they are, we’ll give you an estimate to protect your home from this problem. The screening being added to this low porch will prevent animals from ever nesting under it again. Many animals seek this type of shelter for protection from the elements and the safety from predators that it provides. We commonly see groundhogs, skunks, raccoon, opossum, feral cats and rats using these areas. Armadillos will also burrow under structures, which is why we offer Armadillo Removal. This particular porch had become the popular place to be for over a dozen feral cats that a neighbor was feeding. We disinfected and deodorized the area under the porch and sealed it up. Now this client can enjoy their sun room again without the noises and odors associated with having animals living underfoot. Tampa Wildlife Control provides nuisance Tampa animal removal services throughout Tampa and it’s surrounding communities. Below you find great information on some of our most common critters and just what they might be up to in your yard or home. Raccoon are the official state mammal for Florida. They are generally nocturnal animals and will spend most daylight hours in their dens. The average size of a raccoon is 12-30 pounds and has a ringed tail and fur that is grayish sprinkled with black. Their mating season begins in February, producing 2-5 cubs or kits per litter in April or May. Why are Raccoon considered a nuisance animal in Tampa? Already have a raccoon living in your attic in Tampa or basement? Tampa Wildlife Control can help! We can humanely trap the mother and her babies and repair any damage they may have caused. We can also help prevent raccoon from getting in your home with preventative seal ups. We can inspect your property and let you know of any areas that may become a problem later on. Give us a call if you have a raccoon problem in the Tampa area! Opossum or possum are the only marsupial or pouched animal in the state of Florida. They are generally nocturnal but during the winter months they may forage during the day. The average size of an opossum is 9-13 pounds. They have long coarse grayish white fur and a scaly tail. Opossum have an extended breeding season from December to October and usually produce 2 litters per year, during February and June. Just one litter may have as many as 13 joeys or babies. Opossum are scavengers. They thrive in suburban settings due to the abundance of food. 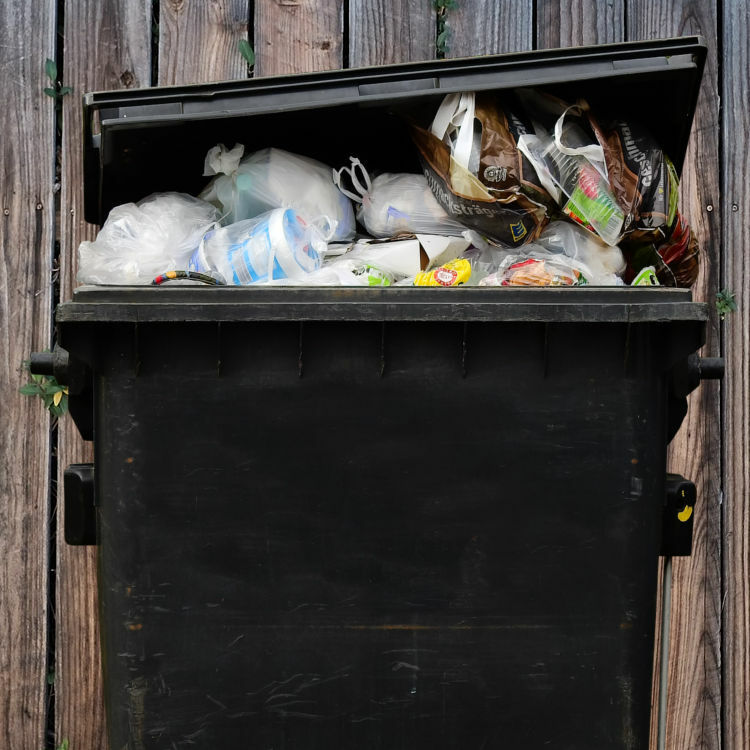 They can find meals from your trash can, fruit trees, gardens, and even steal your pet’s food. They’re also great climbers due to their prehensile tail. They can take up residence in your attic, basement, crawlspace or shed. They tend to be a bit lazy, so they will look for easy entry into these areas. Generally, Opossum are solitary creatures, but we have pulled more than half a dozen from a single home during the winter months. Already have an Opossum living in your crawlspace or digging in your trash can? Tampa Wildlife Control can help! Call us if you need opossum removal in Tampa County. We can humanely trap and relocate them. We can also prevent re-entry into your home by animal proofing any entry points the opossum may use. Skunks are usually black with white stripes. They have the ability to spray a smelly secretion up to 12 feet with great accuracy. The average size of a male skunk is 6-14 pounds and a female is 4-10 pounds. They are generally nocturnal and spend most of the daylight hours in their dens. Skunks breed during February and have litters of 4-8 kittens in May. There are two main reasons people want Skunk Removal, the damage done to lawns and the smell. Skunks grub at night which leaves small cone shaped holes in your yard. The more food they find the more your yard will look like a mine field! We have seen freshly sodded yards destroyed overnight by grubbing skunks and raccoon. Controlling the population around your home is the most effective way to limit the damage to your yard. The skunk’s odor is something that is a real nuisance, especially during breeding season. It seems like you can’t go a couple of miles without smelling our little striped friend. If you think the smell is bad now just wait until they have a litter under your shed, deck or even your A/C unit. Juvenile skunks can’t control their sprayer as well as the adults so they like to practice. They are indiscriminate sprayers, spraying at everything, even each other. They are much like a child with a new toy! 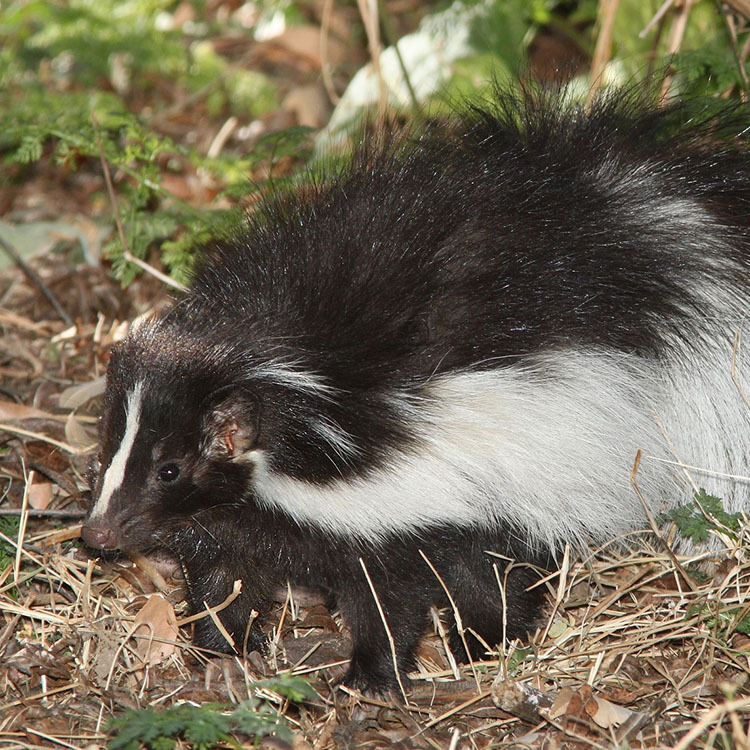 If you have seen or are smelling a skunk on a regular basis, we suggest you give us a call! Tampa Wildlife Control can help prevent a skunk and her family from taking up residence under your home or shed. We can also humanely handle your existing skunk problem and give suggestions on habit modifications to deter more skunks from trying to move back in! In Florida, we have two common types of squirrels, the Eastern Gray Squirrel (pictured above) and the Eastern Fox Squirrel. The Gray Squirrel is the most common and is gray with a cinnamon tone and a white underbelly. The hair is much longer on its bushy tail, which is pale gray or white. The Fox Squirrel varies greatly in color, but usually has gray and black hair on their backs with an orange belly. The orange color may extend to the feet, cheeks, around the ears, and to the edges of their tail. Squirrels typically breed twice a year, December to February and May to June. The first litter is born in February or March and the second in June or July, each containing 2-4 kits. During winter months and breeding season, male and females may share nests, this is when we get most of our Squirrel Removal calls. These nests are usually in trees, but may be in the attic or exterior walls of homes. It is extremely dangerous for squirrels to nest in attics or walls due to their aggressive gnawing on electrical wiring and cables. Their constant need to chew can cause extensive damage to any structure they inhabit. Squirrels and other rodents cause an estimated 30,000 house fires each year. If you hear scurrying in your attic, scratching in your walls or see squirrels on your home call us for an inspection! We will find any possible or active entry points and trap your nuisance squirrels. We will also give you a list and estimate for any animal proofing that we feel is necessary to keep your home pest free. You are welcome to tackle these jobs yourself or have us complete the job for you. There are several species of rats. These rodents include the black rat ( Rattus rattus rattus), the Norway or brown rat (Rattus norvegicus), and the greyish roof rat, attic rat (Rattus rattus alexandrinus). Identification by color only can be misleading since individual color variations can occur and resemble another species. Rodent control in Tampa FL area often involves the attic rat or roof rat which is a common rodent species to invade dwellings particularly into the attic areas and garages. Rats can enter homes and buildings through openings as small as a 1/2 inch. These rodents are notorious gnawers and can enlarge a small opening with sharp teeth to gain entry. 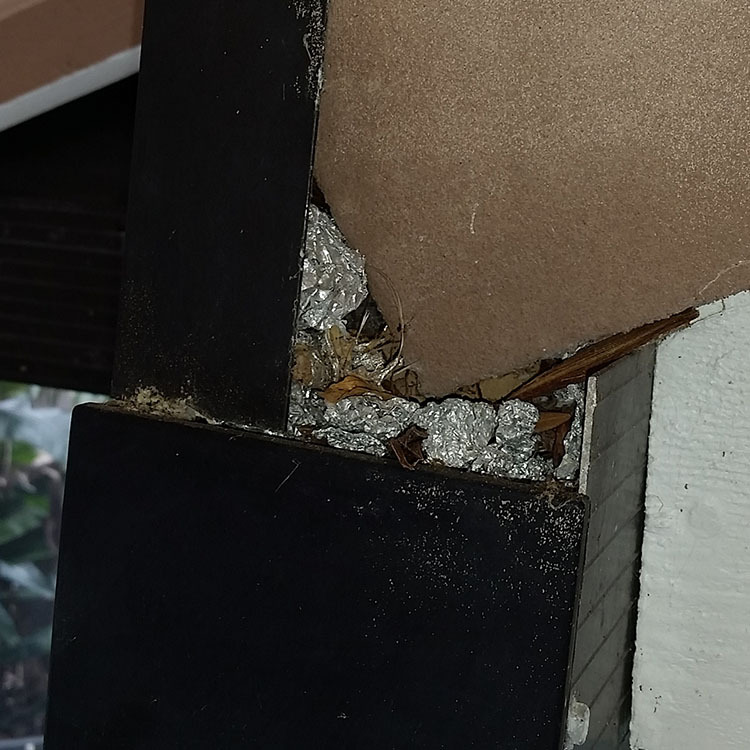 Common entry points for homes is where the A/C tubing enters the siding and any small gaps around the roof or eve areas where rats often can gain access to the attic. Breezeways attached from the garage to the home can often provide rats easy access to the home. Garage doors are generally not sealed well enough to exclude rat entry. Food preferences vary somewhat by rat species but rats are basically omnivorous and will eat virtually anything when hungry. Rats must gnaw to keep their teeth ground down and this results in property damage to homes, facilities, food packaging, cars and other property. They are night time creatures primarily unless they're under stress to find food or their habitat is disturbed. The roof rat is a particularly good jumper and climber. Rat habitats vary by species with some preferring nesting in ground burrows, sewers, others in trees and dense foliage, and some in attic sites. Rats are capable of breeding year round especially in warm climate like the Tampa County area producing up to five litters per year. The rodent gestation period is only 21-23 days and each litter can number usually 7 but up to 14 offspring can occur. The life span for rats is up to three years but due to predators and species conflicts most rats live for about one year. However, any significant population loss is quickly restored by an increased reproductive rate restoring the previous rodent population level. Rats are dirty creatures that have been responsible for spreading serious illnesses and diseases. Rats damage property with their daily gnawing and have been known to chew through auto wiring harnesses costing hundreds in repair costs. Many attic fires have been attributed to rats chewing on and shorting out attic electrical wiring. Everyday rats contaminate dishes, utensils, and food in homes and businesses with their saliva, urine and droppings. 1. Sealing holes and gaps around the perimeter of your home will help reduce rodent entry opportunities. 2. Pet food should not be left outdoors especially at night which can attract rats and mice to your home or business. 3. Bird feeders are fun to have but can feed many rats and encourage them to nest nearby - possibly inside your home or garage or attic. 4. Professional service can help intercept and eliminate rat activity early on. Rats live near people and take advantage of all available resources to survive and even thrive. It is estimated in some cities that the rats out number the people. Rats will also attract snakes to the area, which is why we offer Snake Removal. The primary concern for most people is the odor but there are a few other things to be conscious of when dealing with a dead animal. Most wildlife is susceptible to external parasites and we often encounter fleas and ticks on the animals we deal with. Depending on the species of animal that has died you could run across several other parasites both internal and external in addition to zoonotic diseases that could potentially pose a threat to your health. The best course of action is to simply avoid close contact with a dead animal unless wearing proper protective gear. How can Tampa Animal Control help? 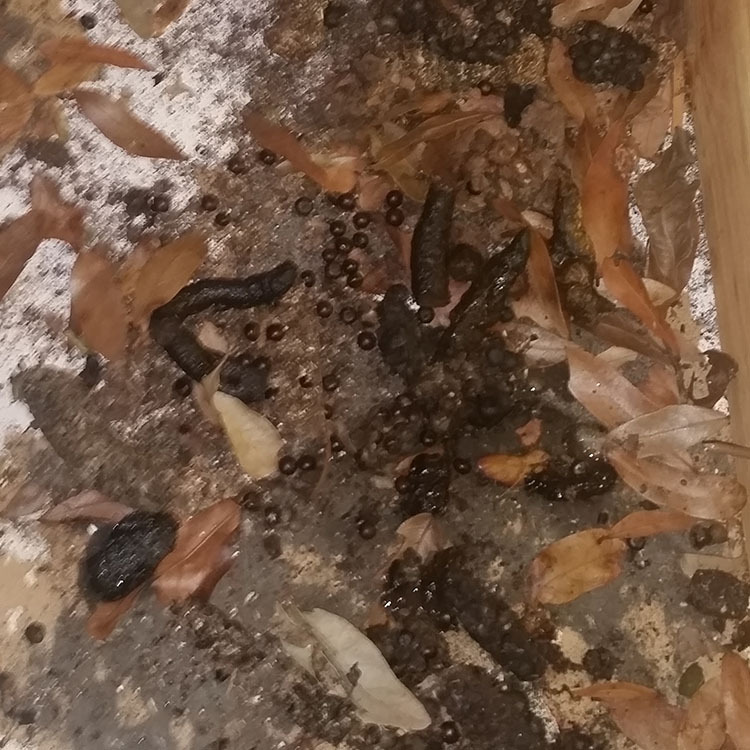 Tampa Wildlife Control will find the source of the offending odor and remove it. After the animal is removed we will use a variety of products to clean up the mess left behind and disinfect the area to help with the odor and kill bacteria that may be present. 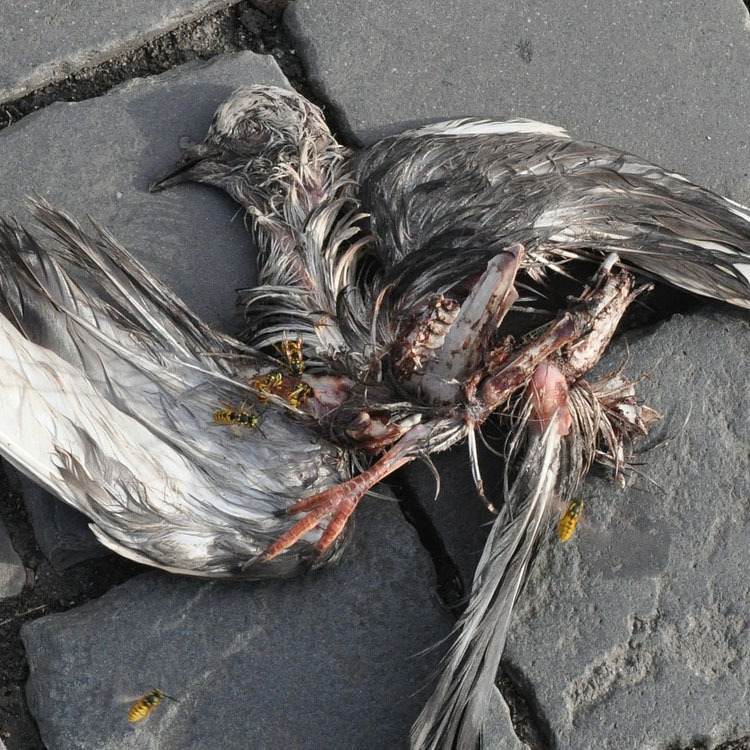 Because we are also a licensed pest control company (most wildlife services are not) we will also be able to treat the area for any fleas, ticks, mites, maggots, beetles or other insects that may be present due to the carcass. Beyond all of that, if an animal made it’s way into your home we will inspect to find out how and give you a quote on animal proofing or, if you would prefer, tell you how to do it yourself. These removal calls may be as simple as picking up a dead animal from your yard and spraying a disinfectant or as complicated as disassembling duct work, moving large amounts of materials or cutting holes in walls to get to the source of the problem. Given the varying amount of time, size of animal removed (deer will cost more), specialty tools and expertise involved we are unable to quote this without speaking to you to learn the specifics of your problem. Continue reading for Marijuana News in your local area.